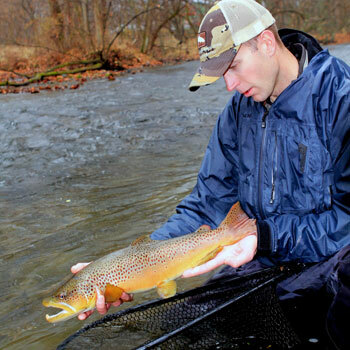 George Daniel began fly fishing at age 6 while growing up in Potter County, PA and credits Joe Humphreys for the bulk of his knowledge along with many national and international fly fishing professionals. George has been seen on ESPN and OLN while competing in the Great Outdoor Games and the Fly Fishing Masters. George’s passion is in fly fishing education and conducts lectures/seminars throughout the country. George Daniel, a competitive fly fisher has effectively used just about every nymphing technique there is. He's been to Europe and competed against some of the best European fly fishers in the game. He's observed, learned and applied the best techniques to his craft. Listen in to learn George's nymphing techniques and you'll be a better fly fisher for it. George Daniel a professional guide and competitive fly fisher will take you on an exciting journey with streamers. He'll explain how to read the water, trout behavior, equipment, casting and night fishing as well as discuss some of the best streamer patterns being used today. He logs over 200 days a year on trout waters near and far. George’s first book with Stackpole Books, “Dynamic Nymphing” is now for sale. George will have articles published by Fly Fisherman and Fly Tyer in 2012. George currently resides in Lamar, PA with his wife, Amidea and their two children along with their two golden retrievers that answer to the names Helios and Madison. He’s pro staffer for a number of fly fishing companies including Simms, Scott Fly Rods, Scientific Anglers, Smith Optics, Lamson Reels, Loon, Regal Vises Also, George is an Umpqua Flies contract fly designer.